Attractive serviced apartments for the price of a hotel room. 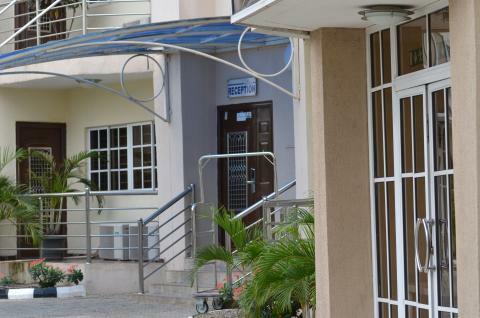 Of the many things to like about Sigma Apartments, the most important to many travelers to Nigeria's capital is the high-speed wireless Internet. In a city where even the largest hotels provide spotty connectivity, Sigma's is as good as it gets. Over nearly a three-week period, it performed with minimal disruption, always quickly remedied - a rarity anywhere in town. If that doesn't attract you, you'll appreciate the spaciousness, the well-equipped kitchen, the cleanliness - someone's always scrubbing something, inside the buildings and out - the convenient location, the security, the taxis just outside, the short walk to restaurants and small shops, the much-worked generator that covers for the frequent interruptions in grid power, and most of all, the friendly, helpful staff. A shower hose that sprung a leak was fixed within minutes! There's also a small restaurant that provides room service - and if they don't have what you order, they offer to send someone to the market to get it. I also love the stand-alone, light-flooded, well-equipped gym - not depressingly dark as in so many hotels - surrounded on all sides by window walls, but tinted outside for privacy. The outdoor pool is attractive, though I didn't have time to use it. But even with a hectic schedule, I could enjoy the gorgeous flowering bushes everywhere on the grounds. I stayed initially because a friend was involved in the property, but I've made it my home away from home because it allows me to be productive and comfortable.